Kayriott Hotel and Suites is a luxury and premier business destination at Km 3 Refinery Road, Ekpan, Effurun in Delta State. It provides the finest personal service, comfort and facilities to guests. This top class hotel offers a warm, relaxed and refined ambience to guests. Kayriott Hotel has a spa that offers different facial treatments and massage therapies. Kayriott Hotel offers 72 air-conditioned accommodations with laptop-compatible safes, complimentary bottled water, flat-screen televisions with satellite channels, refrigerator, sofa, telephone, wall lamps, mirror, bedside cabinets, desk, private bathrooms with shower/tub combinations, complimentary toiletries, slippers, bathrobe, towels and hairdryers. This Warri hotel provides complimentary wireless Internet access and breakfast. Housekeeping is provided daily. 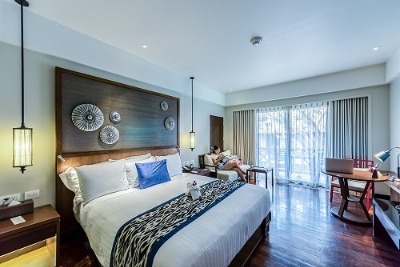 The rooms are divided into Standard, Executive and Suites. This hotel's on-site restaurant serves a variety of dishes and guests can order a variety of drinks from the pool bar. Kayriott Hotel has a spa that offers different facial treatments and massage therapies. Guests can choose to workout at the gym, before proceeding to the sauna for a steam bath or the outdoor pool for a couple of swimming laps. Female guests need not stress themselves over their hair as the hotel has a salon to cater for their hair needs. For meetings, intimate gatherings, grand weddings, seminars and Annual General Meetings, Kayriott Hotel and Suites offers a 300-350 Seater Conference Hall for an extra charge. Laundry service, business centre, and car hire services are provided at a surcharge. There is a parking space for guests and the premises are guarded by security personnel. Children: Babies and children under 12 stay free. Q: Does Kayriott Hotel and Suites offer free Wi-Fi? A: Yes. It offers free Wi-Fi to checked-in guests. Q: Does Kayriott Hotel and Suites have a swimming pool? Q: Does Kayriott Hotel and Suites offer complimentary breakfast? Q: Is there a fitness centre/gym at Kayriott Hotel and Suites? A: Yes, it has a fitness centre/gym. Q: Does Kayriott Hotel and Suites have a restaurant? Q: Does Kayriott Hotel and Suites have on-site parking? Is it free? Q: Does Kayriott Hotel and Suites offer airport pickup or shuttle services? Q: Does Kayriott Hotel and Suites allow smoking in rooms? A: No, it has designated smoking areas. Q: Does Kayriott Hotel and Suites have an event centre/conference rooms? A: Yes, it has an event centre/conference room. Kayriott Hotel is a top-class hotel in Warri, Delta. My stay was not bad. It was not exactly the best hotel in Delta, though, but it was decent. I will advice that the staff do more to keep the place clean always. It was a great time, very short but I enjoyed every moment. From walking into the building the receptionist was welcoming with a big smile on her face and the room was big. I liked the fact that nobody came knocking on my door before leaving which made me relax more, and when I needed any thing I got a feed back fast. Apart from the shower and the air condition that was not working well, it’s a lovely place to be. My stay was fine except that the room I was in had a stale smell. Have nice pictures of Kayriott Hotel ?